Alternative Breaks - REACH, Inc. 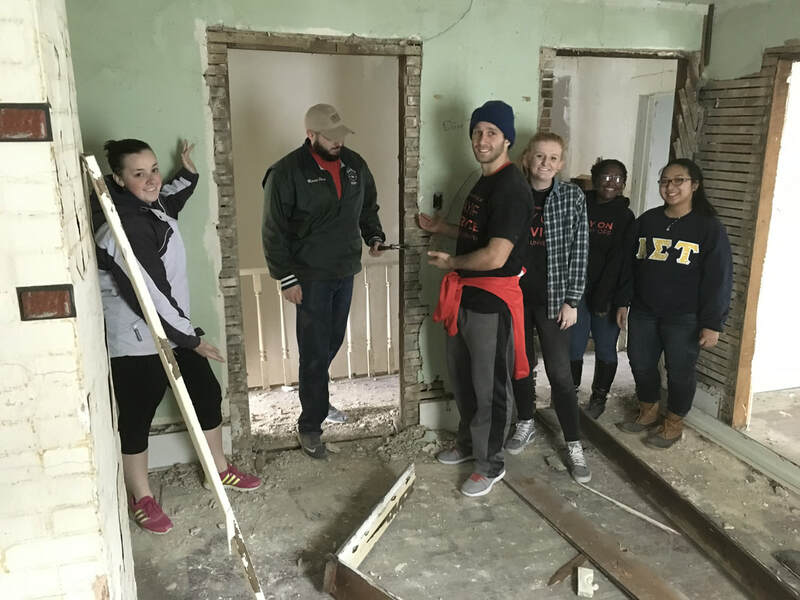 Instead of hitting the beach for your Fall or Spring Break, hit a couple hundred nails with a hammer to restore an abandoned home! In place of feeling sand between your toes, feel fresh, healthy soil in a community garden! Rather than shredding waves, spend your break shredding cheese and serving meals to the homeless! Our mission is to serve the community by connecting and engaging with individuals and groups in positive service experiences, in which they will discover strengths, skills, and assets to use in order to transform lives, homes, and entire communities. Our hope is for all who come to REACH on an Alternative Break to learn their value and worth by experiencing the joy of service. "Every once in a while, there are small instances that change your life and give you an overwhelming sense of peace. Although this experience was only a few days, my experience with REACH changed how I view the world." Why should REACH coordinate your Alternative Break? Your work will be relevant, beneficial, and equitable. ​REACH’s commitment to the ideas and applications of Asset-Based Community Development means your service will complement—not replace—the work of skilled builders and human services workers in Southeast Roanoke. REACH’s Executive Director has postgraduate credentialing in education and several decades of experience in coordinating and inspiring volunteers. REACH’s community partners can lead discussions and give talks on various social justice and nonprofit themes. REACH’s community partners will dote on you. REACH is highly connected throughout the city of Roanoke, opening numerous doors of potential service opportunities with people of all sorts. Often enough, those people want to connect with our volunteers, a.k.a. you, through engaging conversation, delicious meals, and other various ways of celebrating community. The Star City of the South has swimmable rivers, comfortably scalable mountaintops, delicious food, amazing sites, rich history, and countless opportunities to explore during your free time while here. REACH's Alternative Breaks are cheap. REACH needs you, not the other way around. REACH keep prices competitively low on account of our focus on bringing volunteers to Southeast Roanoke, as opposed to making a profit. For more Alternative Break FAQs like the one above, click to view our Trello board here. Is your school a Break Away member? Check out our listing in the SiteBank! Register for an Alternative Break Week / Weekend with REACH! My role on the JMU Alternative Weekend Break trip was to serve as the adult learning partner. The two co-leaders were solely responsible for planning and leading the trip and communication with the REACH leaders. I have been a participant on numerous service-learning/community service trips in the past 7 years and although each of them was memorable and amazing in different aspects, the REACH trip was different. We were truly welcomed from the minute the van pulled up in the parking lot and greeted by Ryan and Phil. After a “centering” exercise that included using our senses when being offered a cup of tea with Al, and an introduction of REACH’s mission by Tim, all of the participants were ready to begin meeting members of Roanoke’s community and learn more about the various organizations available to enable individuals to transform their lives in a purposeful and positive manner. Although reflection activities are a huge component of the JMU Alternative Break Programs, REACH also provided time for group reflection and taking the time to answer questions to assist us in understanding the specific dynamics and resources involved in the Roanoke community. This enabled us to successfully discuss “the What?” and “So What” aspects of this specific model of reflection, and to begin determining how we can best understand the “Now What” component and how we can impact our JMU home community of Harrisonburg and Rockingham County, and hopefully any community where we may reside in the future. Who would have imagined that a brief weekend adventure would be as life-changing and inspirational as our experience with REACH was the last few days? Caroll may be contacted at wardcl [at] jmu [dot] edu. ​I’ve never been to an event or a break where the organizers are so focused on making sure that participants are having a good time. Every staff member at REACH cared about participants’ personal growth and took the time to discuss their philosophy on service. Every once in a while, there are small instances that change your life and give you an overwhelming sense of peace. Although this experience was only a few days, my experience with REACH changed how I view the world. For that, I am so grateful to everyone who made this break happen. Andrea may be contacted at andreagar218 [at] gmail [dot] com. My experience with REACH was so great! I loved becoming more educated on the social justice issues in the Roanoke area and getting to help serve. I’m thankful for Tim and Ryan and how they helped our AWB group think more deeply about the service that we are doing and to consider the impact that we make, whether it be long-term, short-term, positive or negative. I find REACH’s goal to restore hope and empower others within the community to be beautiful and it is something I will surely take with me. Magi may be contacted at magi.linscott [at] gmail [dot] com.